Home Shop by Category Shaving Creams Taylor of Old Bond Street St James Collection Shaving Cream 150gr. Taylor of Old Bond Street St James Collection Shaving Cream 150gr. Taylor of Old Bond Street St. James Collection Shaving Cream Bowl. A modern fresh fern fragranced St. James Collection Shaving Cream is allergen-free and has been specially formulated for Sensitive Skin. 150gr. 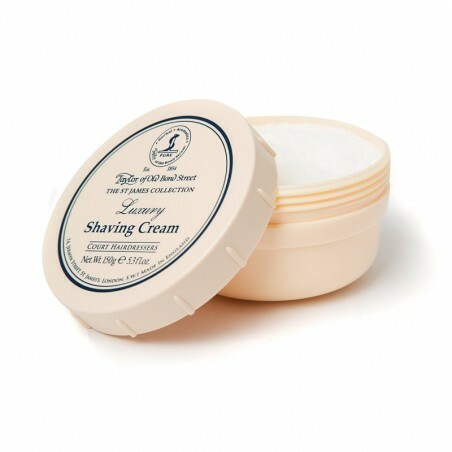 This is a rich, long-lasting shaving cream scented with citrus, woody and floral notes. It has a fresh, masculine aroma using amber and sandalwood leaving an elegant smell on your skin. This is one of the bestselling scents in the collection that you won’t regret using. We recommend you use a quality razor to get an excellent result.